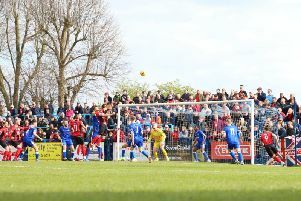 Marcus Law insists Kettering Town’s Evo-Stik Southern League Premier Division play-off hopes are far from over after their fine run of form finally came to an end last night (Thursday). The Poppies’ busy finish to the campaign continued with a clash against already-relegated Bedworth United but they were beaten 1-0 and had Wilson Carvalho sent off early in the second half. That brought an end to Kettering’s 11-match unbeaten run but they are straight back into action in their final home game of the season tomorrow when they host Bideford who have also been condemned to the drop. The Poppies are two points behind fifth-placed Hungerford Town and three adrift of fourth-placed Leamington with three games to play. Law is now targeting maximum points from the last three matches to secure a top-five finish and he admits his team are now playing “pressure football”. “We are not out of it, we are still in there,” the Kettering boss said. “There are nine points to be had and 83 will secure it. “Maybe our result last night has lifted a bit of hope with all of them but are all four teams going to win at the weekend? “It’s pressure football. We have taken 27 points out of 36 and that’s a massive achievement to get us into this situation. “Nine points out of nine and we are in the play-offs and that’s on the assumption that everyone else wins. The Poppies will have fitness doubts over striker Rene Howe, who missed last night’s game while Gary Mulligan was withdrawn at half-time having made his return from injury.